DIY bacon holiday ornaments are ideal for gifting to your family and friends. They are also wonderful to hang on your own Christmas tree as well. They are a funny cute type of craft project that is unique and creative. Rated moderately easy to make this is one decoration that is sure to have every bacon lover grinning from ear to ear. Bacon is one of those foods that people fall in head over heals in love with. You see that crispy goodness, you smell the glorious aroma, you taste that perfectly salted piece of delicious meat. Oh bacon, how I do so enjoy your sweet sweet flavor. I am addicted. Which could be the reason that you now have the opportunity to make these delightfully different food theme ornaments. Grab Some Bacon and Let's Get Cooking! The first thing you will need to make the perfect homemade holiday decorations are perfectly cooked crispy pieces of delicious bacon. One slice per decoration so figure out how many ornaments you will be making and cook up sufficient slices to complete the project. Paper Towel to dab the grease off your bacon. String, crochet thread, yarn, or fishing line. 1 or 2 clothes hangers. Before you start the dipping process you will need to make a small hole in each slice for the string. You will also need to put your string or fishing line through the hole in your bacon. When poking the hole, do it in the fatty part of the bacon as this stays somewhat soft even after it is cooked. I use a very big sewing needle to do my holes and crochet thread to string through as it is thicker than normal string. You could also color coordinate yarn or ribbon for this purpose if that is your preference (ha...fancy bacon). You will need something to preserve your bacon and harden it well enough that it will last without spoilage. I chose a marine varnish to make my homemade Christmas bacon ornaments with but most types of varnish should work. Mine are now about 4 years old and are holding up very well. I will admit that there are better things that will make a more durable bacon Christmas decoration but I had a new baby at the time and wanted to keep any toxic aromas to a minimum. With it being a snowy cold winter outside I did not want any fumes around my home and my new wee one. So guess who went down into the basement to create these (did I mention how much I love bacon?). 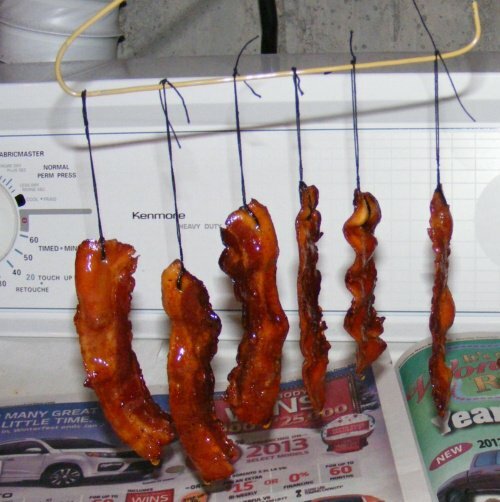 You will need someplace to hang your homemade bacon decorations as they cure. I took a clothes hanger and cut it in the middle, making sure I bent the two open ends so that my decorations didn't slide off. I also put newspaper underneath for the drippy mess. I recommend that you dip and completely cover your pieces of bacon in the varnish at least 3 times, allowing 24 hours in between each and every dip. Yes it takes time... but it is totally worth it! Warning: Please make sure to do this in a well ventilated area and follow all instructions on the varnish can. 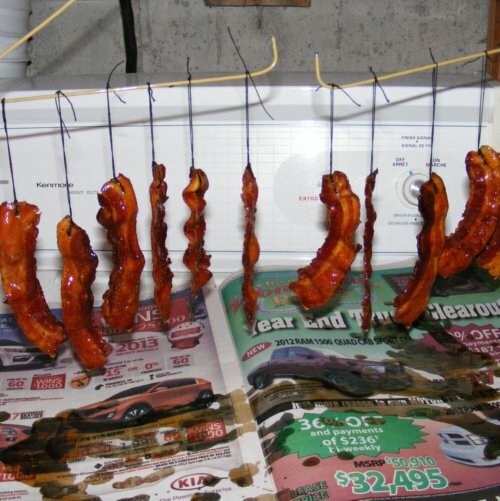 Once your bacon decorations are dry you can hang them on your tree and watch them glisten in the Christmas lights. They are a fabulously unique gift for family and friends. Just a little note of warning. These decorations will look so delicious that you may be tempted to eat them right off of the tree. You cannot so please don't try. Varnish is definitely NOT a food product!